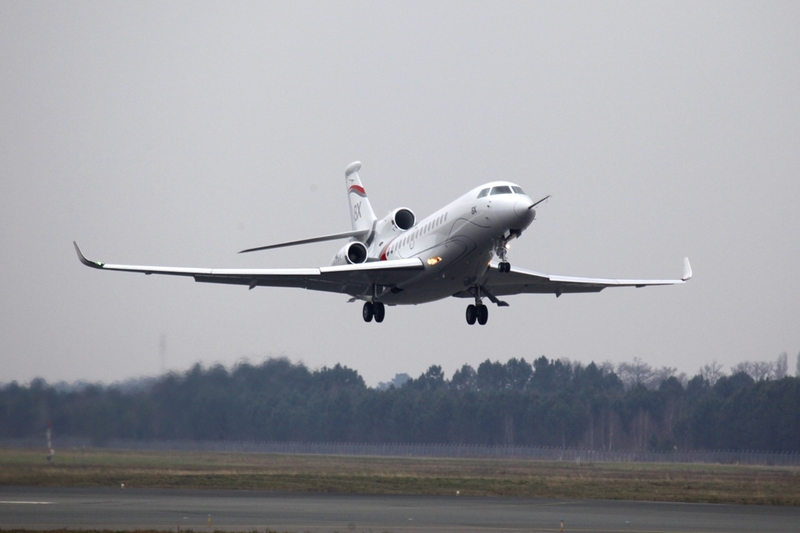 Feb. 10, 2015, Bordeuax, France - Dassault Aviation has announced that the company’s new flagship, the ultra-long range Falcon 8X, successfully completed its first flight a little more than one month after rollout. With test pilots Eric Gérard and Hervé Laverne at the controls, aircraft 8X s/n 01 lifted off from Dassault Aviation’s Mérignac plant near Bordeaux at 02:00 PM. The aircraft leveled off at 5,000 ft (1,500 m) and raised its landing gear before beginning flight handling maneuvers and system tests at 15,000 ft (4,500 m). It later climbed to FL400 (12,000 m) accelerating to Mach 0.80. The aircraft subsequently descended to 5,000 ft for approach and landing at 03:45 PM. Falcon 8X s/n 02 and 03 are scheduled to take to the air in the coming months. Each will take part in the flight test program that is expected to last around 500 flight hours. Serial number three will leave midyear for the Dassault Aviation completion facility in Little Rock, Arkansas, where it will be fitted with a complete interior and undergo a stringent system test campaign.